Another new production from Mazze has emerged, this time it's called HollyPaint and it was uploaded to Aminet for us. 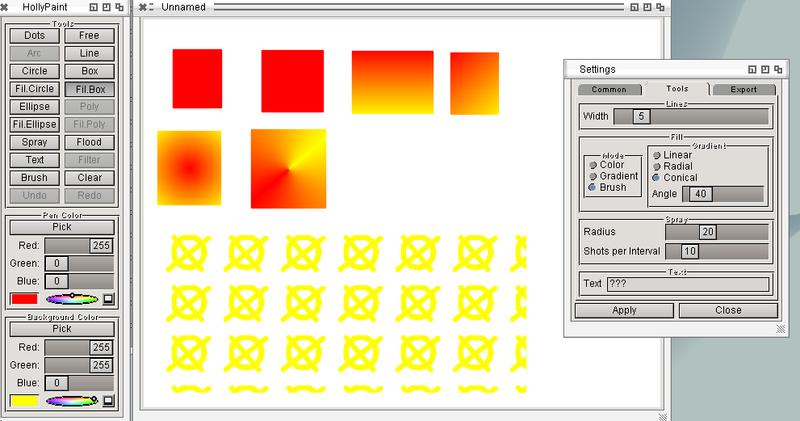 HollyPaint is a brand new bitmap graphics editor (painting application) written in the programming language HollyWood and also uses the MUIRoyale plugin for the interface. It has everything you want from a modern paintprogram and has a toolbar window, a drawing canvas and has standard support for filters. The toolbar window let's you select the 'normal' tools you would expect form a painting program (dots, freehand, cicle, square, colorselecting etc) and currently it has the filters ArcDistort, BarrelDistortBrush, Blur, Gray, Monochrome, Charcoal, Contrast, Edge, Emboss, Gamma, Modulate, OilPaint, PerspectiveDistort, Pixelate, PolarDistort, SepiaTone, Sharpen, Solarize, Swirl, Tint, Transform and WaterRipple. Because it is written in Hollywood, HollyPaint immediatly became available for a multiple of platforms (Aros, Classic AmigaOS, OS4, MorphOS). Mazze also provides the sources and bugs can be reported in the bugtracker.